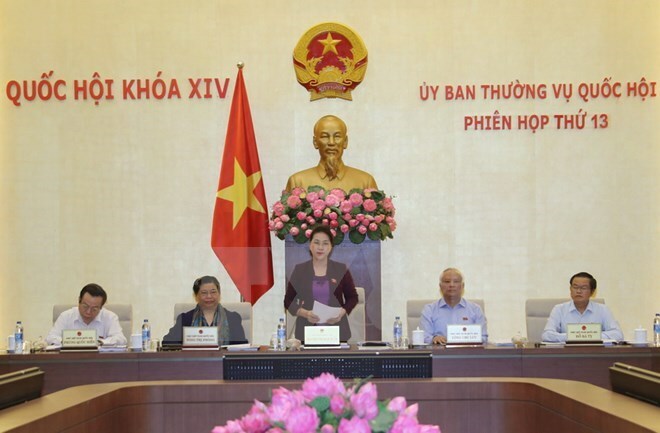 Hanoi (VNA) – Numerous issues will be discussed at the 13th session of the National Assembly (NA) Standing Committee that opened in Hanoi on August 10. NA Chairwoman Nguyen Thi Kim Ngan said during the seven-day session, the NA Standing Committee will give opinions on some debatable issues of the four draft laws that deputies commented at the NA’s third session, namely the revised laws on forest protection and development, fisheries, public debt management, and denunciations. The committee will also scrutinise five bills scheduled to be submitted to the NA for consideration at the upcoming fourth session, including the amended law on national defence, the law on the protection of State secrets, the law on amendments and supplements to some articles of the law on Vietnam’s overseas representative agencies, the law on amendments and supplements to some articles of the law on judicial records, and the law on public administration. It is set to look into the outcomes of piloting the costume of judges at People’s Courts and the outcomes of the NA’s supervision of the implementation of policies and laws on state administrative apparatus reforms between 2011 and 2016. The establishment of the People’s Court and People’s Procuracy of Sam Son city, Thanh Hoa province, along with the use of the central budget in 2016 and 2017 will also come under discussion. The NA Standing Committee is scheduled to supervise the implementation of policies and laws on investing and using BOT transport projects at this session.